Cooler for sodas in the glove box and a 120v outlet in armrest. We bought our vehicle from a used car lot. It had 200, 000 miles on I. The only issues that we have had so far is the tpms (tire pressure monitoring system) was broken by the tire repairman. We had to get a new tire because the alignment was off. So now the check engine light comes on because the satellite from the tire pressure monitoring system has been removed. Cost for a new one is $70. 00. The only other problem I have had is that the 02 sensor for the return line is showing low volts and comes on every blue moon. It is nice it is all leather, it is an automatic but you can manually shift it from 1st to 6th if you want to. It gets good gas mileage. It has a very good sound system that is stock. The seats are comfortable there's not automatic seats, but it is nice they're comfortable. The only other issue I have is that the car looks good the wheels are nice, it drives good, it tracks on the road fine and it is a good handling car. The only other thing is that it does not have a lot of power. It lacks passing power but that is the sacrifice that you have to make for the fuel mileage. All in all it is a good car. There is no fix for the transmission temperature issue. The car was purchased used with over 130, 000 miles on it. The lining is starting to come off of the car were different parts meet. We had to replace the gas cap. The check engine light comes on if the gas cap is not closed all the way. Around 150, 000 miles the starter had to be replaced. After the starter was replaced the coolant pipes also needs replacing. The car has had consistent transmission temperature issues. If I drive over 65 miles an hour for 30 minutes the light comes on and I have to pull over to let the car cool down. When we purchased the car we got the transmission oil replaced and it did not fix the issue. We have taken it to the dealership and to different mechanics to see if they could tell us what is wrong with it, but no luck. The car is very comfortable and small so I can maneuver through traffic quickly and smoothly. We bought this car used. It looked great on the outside, but it required a brake booster right away. Multiple times since buying this car we have had to buy control arms, and also spend money on repairs I have never heard of before. I do like how the car looks and drives now that I'm familiar with it. Having a hatchback is convenient. The back seats are able to fold down which is great space for hauling stuff. The back seat is cramped and it can be hard to exit the back seats. There are also some blind spots that I haven't had in other cars out the front windshield. Overall, I have grown to like the car at best. It passed the last PA inspection we had done which made me appreciate it more. Air condition feels nice and cold, but I have a hard time finding a setting that feels cool and not freezing. 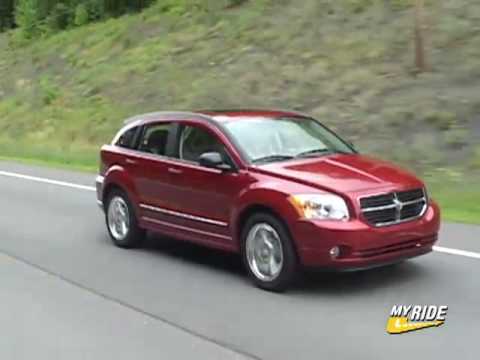 2007 Dodge Caliber. Start Up, Engine, and In Depth Tour.